Art has been an important for her life from a very young age. At the age of 12 she illustrated a children’s version of Pilgrim’s Progress. The book and her 70 feet long scroll of drawings were featured on an episode of Blue Peter. During her career in nursing she spent time in the Canary Islands, where she sold paintings and drawings in street markets. Her artwork these days specialises in the medium of Silk Screen printing, where separate layers of colour are used to build up the final image. Her focus is on patterns and colours, exploring the change of mood that can be achieved by using different colour combinations. Her inspiration comes from her own experience of the Natural World, such as the birds in her garden, drawing upon a wide range of artistic movements, such as Abstraction, Art Deco and Ethnic Art. Angela graduated from UCA Farnham in 2006 with a degree in Fine Art. Her current practise is as a printmaker and maker of artists books. She usually makes small work in small editions, sometimes just as a one off. Her prints are a combination of linocuts, stencils, collagraphs and woodcuts and she prints them in her studio on a relief press. Her artist books are also printed and bound by hand using traditional methods. She adds text from her own work or from appropriated text from poems, books or articles. My books are varied in subject matter depending on the text I use. Some are held in private and public collections including Tate Britain, Oxford Brookes University and Bath Spa University , Italy and North America. Her work is inspired by walks in her local landscape or working in her garden. She also teaches book making and lino cutting workshops. Some of these are held at The Sustainability Centre. The work that makes up this exhibition consists mainly of printmaking techniques that hold a strong emphasis towards nature; they include collagraphs which are a form of relief printing - a print taken from objects glued to a base. These are made from recycled and organic material and printed on paper from managed sources, using water-based inks. As well as being a celebration of our native birds and insects, the work serves as a reminder that to be able to continue to enjoy these delicate, living creatures around us, we must also care for their environment. Since childhood gardening has always been a favourite occupation, but now she looks at her garden in a different way. It is only small but has become a miniature conservation area where a judicious choice of plants, grown without the use of pesticides, insecticides, and other chemicals, attracts a good variety of wildlife. Throughout the seasons she sows seeds, taking cuttings, and planting bulbs, knowing that in time it will provide food and shelter for the tiny, delicate creatures that visit. This cyclic labour of love motivates her creativity and inspires her artwork. ​The beautifully extraordinary nature of ordinary moments, evoking wonder and magic through vibrant colours and intricate detail yet never quite loosing its roots in everyday life. During the summer most of us barely notice the leaves on trees, artists might try and pick out slight differences in shades and tones but mostly leaves are ignored, an anonymous mass of silently waving green. All summer they ply their trade as alchemists, transforming sunlight into sugars, chemical energy, the stuff of life for trees. All summer they casually pump out oxygen breathing it out as easily as we breath it in. All summer leaves go on working, unnoticed and then they die. with all the immobile, the poisonous, the useless, all those bright sharp colours, lime and yellow, orange, red, pink or purple and eventually brown. Dried out, bitter, brittle and sooner or later blow away. wondrous alchemy we have previously taken for granted. Her cards and prints will be on sale during the exhibition. Alexi gathers inspiration from her love of wild, natural places and those steeped in myth and folklore. She has a special affinity with woods and wildlife glimpsed at the edge of things. She is a self taught artist having drawn throughout her life and enjoys experimenting with all sorts of media especially paper and natural materials. She works in pen and ink, mixed media, collage and especially likes 'altering' books and making layered papercut illustrations. Her artwork often depicts wildlife but also images and creatures from her imagination inspired by stories and dreams. Originally from Wales, Sophia draws upon a love of nature and travel to create her highly detailed whimsical illustrations. After completing her degree in Swansea 2010, Sophia wanted to take a 'step-back' from the commercial world of contemporary illustration and the pressures of the art world. She settled on pursuing her dreams and set off to work and travel her way across Australia, New Zealand and SE Asia for 2.5 years. The people she met, volunteer work and many hours wildlife watching influenced her greatly and re-ignited her passion for art- thus was born a 'style' of working, a new love for watercolours and a place within the art world. Nowadays, still borderline nomadic, Sophia lives happily with her Earthbag-building partner. She is self-employed and spends a lot of time painting home, garden and wedding portrait commissions and is very excited about recently being accepted into the ABNA (Association of British Naive Artists). Please do come allong and enjoy Sophia's beautiful work, and maybe find someone a special gift for the Yule season. 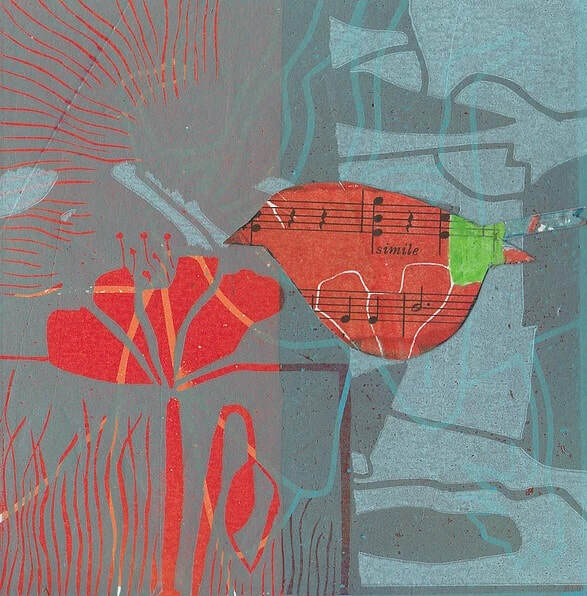 ​​Caroline is an artist and printmaker who studied Graphics and Illustration at Wimbledon School of Art and worked in design and publishing for many years in and around London. 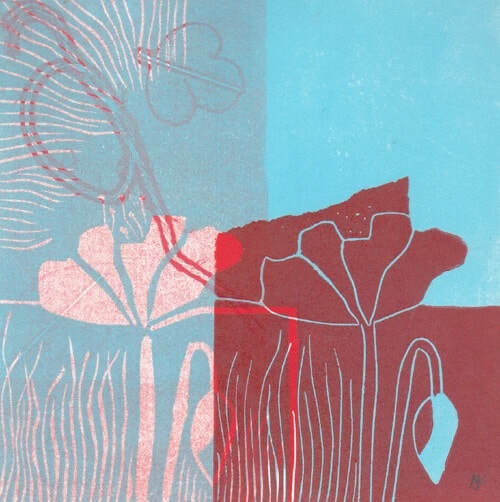 In 2002 she moved to the Lake District where the stunning view from her home in Morecambe Bay and the Lakeland peninsulars inspired a series of monoprints. She found printmaking an exciting and effective way to capture that moody and unique wilderness. 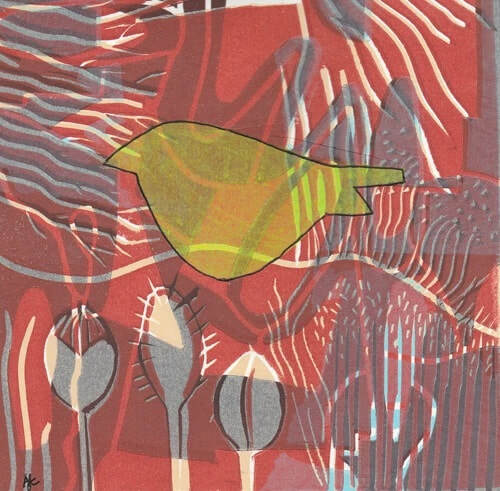 In 2002 she joined the organising committee of Printfest, an annual exhibition and festival of Printmaking in Cumbria. The event has grown in stature year on year and can now claim to be the Northwest's premier printmaking show, recognised throughout the UK. I successfully exhibited there in 2006. ​She moved to Southsea near Portsmouth in 2006, and I was delighted to find the same printmaking techniques work equally well with the softer, gentler landscape of the South Downs and the flat, marshy seascapes of the harbours of Sussex and Hampshire. She is continually experimenting with new ideas and techniques to capture elements of the English Landscape through this flexible and exciting medium. A collection of beautiful photographs of moments in nature. Stillness exists amidst constant change. The transformations may be fast, or so slow that they are impossible for us to witness. With an attention to colour, detail, texture, pattern and form, these images celebrate the beauty and intelligent design all around us. Beauty which needs protecting. Penny studied her BA in Photography. She works at the Sustainability Centre, where she lives in her yurt. She has a passion for creativity, environmental education and social change. ​Drawing forestscapes is about transformation. I experiment with contemporary drawing approaches in the forest to engage my subconscious with the natural surroundings to access, observe and re-present both. I use audio with Whispering Walks and creative writing exercises to access what is just below the surface of my conscious observation, to find a different depth, layer of understanding to work from. Studies on site are captured in notes, audio recordings, sketches, photographs as a pool of sensations and observations. I then develop work in the studio locating a sense of place with a sense of being. I work with traditional and new media and my drawing process has purpose in experience as well as outcome. I am constantly asking, what is drawing for and how can it become more useful in giving a sense of wandering, discovering, away from a digital screen?